I'm in the process of wringing out many issues with the 1-pipe steam system in the house we just purchased... more details will come in an update to my previous post. However, I have one question in the meantime. Our system is almost balanced (new drop header, main venting, vaporstat installed, etc). However, in order to keep even heat throughout the house, I've had to turn off one of the two radiators in each room on the 2nd floor. You see, at some point in the past, a previous owner replaced ALL the 5-tube radiators on the 1st floor with Convectors in cabinets. I can tell when I look up at the floor from the basement... I can see where the pipes USED to go up through the floor... farther out into the room than they do now. On the 2nd floor, all of the original 5-tube radiators still exist... 2 per room. As a result, the radiation on the 1st floor is much less than the 2nd floor. Of course, the thermostat is in the Living Room on the 1st floor. AND, in addition to replacing the radiator in this room with a convector, they also REMOVED one of the 2 units in this room... so the thermostat is in the most under-radiated room in the house. As I said, I've turned off some radiators upstairs to prevent overheating... but now that I'm close to being able to balance my system (after all the improvements), I'm getting a lot of hissing/whistling from radiators upstairs... I'm assuming because I've choked the system down so much to keep even heat. Once it reaches cutoff point, the Vaporstat is cycling on and off every 45 seconds or so. SO, does anyone have any thoughts as to how to re-activate all the turned-off radiators to alleviate the pressure issue, but also keep the 2nd floor from getting too hot while the 1st floor takes its sweet time to get up to temperature? Did they put any insulation board behind the convectors, if they didn't half of it's heat output could be going outside. Not sure what size vents you have on second floor, but instead of turning them off (with the inlet valve) try putting the smallest vent you can get on them to slow them way down. Turning radiators off with the inlet valve is always a bad idea. Those old valves typically don't seal and will still let steam in small amounts, but once it condenses it can't get back out again. You end up filling it with water over time and it will make plenty of noise once that happens. Then on the first floor you could try putting faster vents on those convectors. Don't jump too much though as venting too fast can cause undesired things to happen (spitting and hammer). Also not sure how you are defining balance, but balance means every thing is a similar temperature which doesn't sound like what you have. What do the convector cabinets look like? I wonder if it possible (in addition to the insulation suggestion) if the design of the cabinet is hurting performance as well? That is an outside the box idea, but anything is possible. It sounds like the previous owner let design trump comfort which is never a good idea. The cabinet design is almost identical to the image attached. There IS about an inch or so of airspace in the cabinet above the top vents that seems to hold onto the heat, rather than flowing back into the room. I've been thinking about installing a rounded or angled diverter inside the top of the cabinet that would eliminate this airspace, allowing all of the heated air to escape. Does anyone have any thoughts or experience with that type of modification? Also, as you suggest, I DO have a radiator on the second floor that I had turned off. I turned it back on and there was a lot of water hammer that WASN'T there previous to my shutting it off a few weeks ago. Do you think that trapped condensate would work itself out over time? Slowly evaporate as it goes through the heating cycles? BobC, it looks as though no insulation behind. The convector element is tight to the back of the cabinet... No room for anything. Yes it should quiet down after a few cycles, you may want to give it a little extra pitch to get that water to flow back out. Even putting a couple of quarters under the feet can help doesn't take too much. 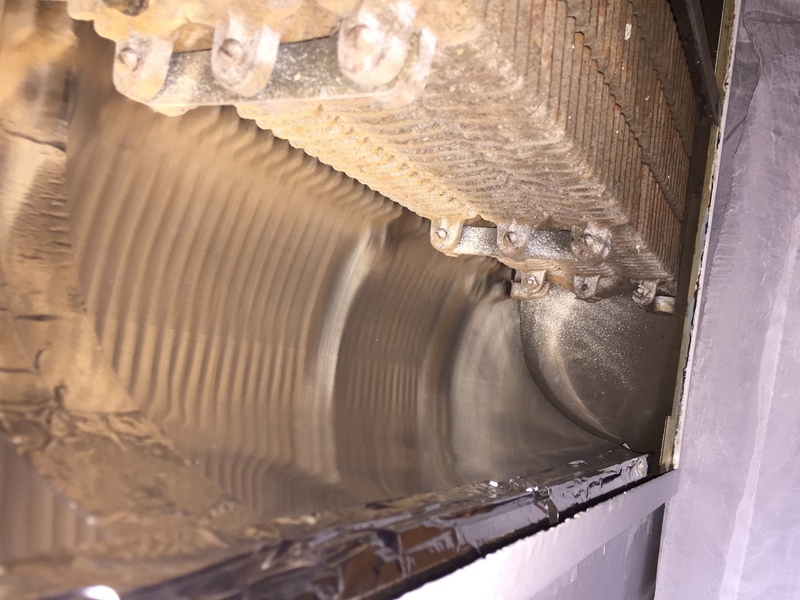 If you can post a picture of the inside of the convector cabinet so we can see what you are working with sometimes that can fuel some creative juices for helping you towards a solution. Since I'm not at home, I've attached a picture of a similar cabinet to mine. If you look at the top inside, and the top front lip that comes down about 3/4", you can picture that whole space that fills with heat that has nowhere to go. When you put the cover back, there's even more headspace above the exhaust grille, amounting to at least 1-1/4" or so. My thought was an angled piece, all the way across from left to right, to eliminate that dead zone at the top by diverting all the air from the back of the enclosure directly to the exhaust grille. I'm mainly curious if anyone has done this and seen noticeable improvement in performance. If there is no room for insulation, could you get some thin sheetmetal or foil back there to slow down the heats trip to the outdoors. Shaping something to encourage the heat to get out of the enclosure and into the room would help. 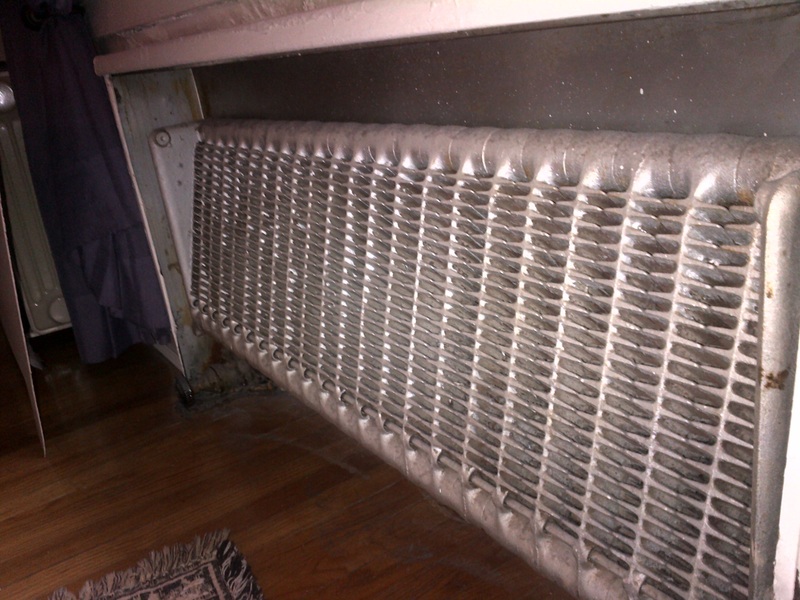 My neighbor did it on a big radiator with a cover (window seat, really) on it, steam, but not convector. He says he helps a lot. They actually used to make them (can't remember where I originally found this, so apologies in advance). Convectors and radiators don't really seem to play nice together, do they? Getting a lot of convector questions lately too. Are there any indications that when they took the radiators out of the first floor, they actually moved them to the second floor and that's why those rooms have 2 radiators? Most second floor rooms just have 1 radiator and more often than not, a little bit smaller than first floor because warm air naturally wants to rise. 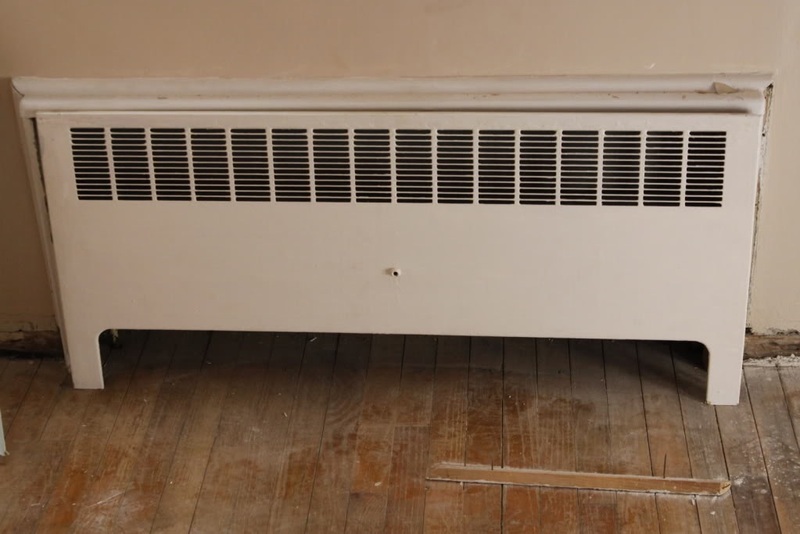 Is there any possibility of moving those second floor rads that you have turned off back to the first floor to replace some of those convectors? That pdf is fabulous. I wonder if THE COZY Dan H posted about a while back would do the same thing as I believe it does have a fan. Fred, I'm pretty sure all of the radiators are in their original locations, only because I don't see any artifacts of them being moved and all of the pipe looks to be of the same era, etc. It looks like the house was designed with one radiator under each window, regardless of floor. - open valves on all radiators I had turned off. What kind of elements are in those convectors- cast-iron or fin-tube? Post a pic if you're not sure. Any idea what the Gross Margins (Percentage wise) are for the big box stores or the Internet Supply houses? Where I used to work, a Major New England Wholesaler said to me that he was thinking of building a store where I lived and worked. Would I buy? (Of course. Better than stocking inventory myself). He said that he wouldn't build the store unless he could put in $1,000,000 worth of inventory. He did. Some think that "Profit" is an obscene concept. And "Overhead" is a ceiling. There's a question, often on the Massachusetts Master Plumbers Exam. Its not a trick. But you better answer it correctly. If you bought an object for $100.00 and you wanted to mark it up by 20%, how much would you sell it for? The thing that I always have to think about is the discount system that the wholesalers and reps use, 10's, 5's and 2 1/2's. Unless I'm doing it everyday I have to relearn it every time. Hi everyone. Just an update. 1. I turned back on the three radiators that were previously turned off. The hissing reduced to almost nothing. 2. Rebalanced my radiators using the Gill/Pajek chart. However, I moved vents around to put Vari-Valves on all the 1st floor convectors and opened them WIDE so as to get as much heat to them as soon as possible. Then, for the rest of the house, I used the Gill/Pajek calculations and reduced by 1 vent size. 3. I modified the 1st floor convectors to eliminate the huge heat sink at the top of each enclosure... built an curved aluminum deflector that pushes the air right out the top vents of the grille cover with no head-space for the heat to get caught. See photo attached below. Saw a modest improvement in the velocity of the hot air coming out after this. - 1st floor nice and warm. - 2nd floor bedroom above the beginning of the Main was getting quite warm (8 degrees above the average of the rest of the house) with both rads on, vented with Maid O Mist #4s. Resorted to turning one of those radiators back off... figure it's ok to split the difference, since there was no other way to reduce amount of steam getting here. - 2nd floor bedroom above the end of the Main is only 2 or 3 degrees above... with both rads vented with M-o-M #4s. Will probably try to adjust this slightly as follows... one of these rads shares a run-out with another radiator... I will drop THAT down to a #4 as well to see if I can slow the venting of that entire runout and grab a couple degrees back that way. Will be posting another thread about radiator covers... stay tuned if interested. You can use the Danfoss TRV (with the built-in vacuum breaker) on 1 or 2 of those hot rooms. Those will only allow the Vent to open when the room is below the set temp. Don't put them on all of the rads or that will create an over-sized boiler situation but they work well. Available at Supplyhouse.com. Another tip if you feel you need a radiator off is do not turn off at the valve. Instead turn the vent upside down and it will be permanently closed, as long as it's one with a float. As an alternative you could remove the vent and install a plug. Doing it in this manner avoids the unintended consequences of turning it off at the valve which could fill the rad with water over time. Glad it is getting better and I really like the shade tree "air director" you put in there....pretty ingenious! All right, so I turned back on the radiator in one bedroom, and then "closed" it by inverting the vent, as per @KC_Jones. Then, in the bedroom at the end of the main that was getting hot, I put a TRV on the larger radiator, shutting it down at 69 degrees. To eliminate some riDICulous noise in the master bathroom radiator/convector, I splurged on a Vent Rite #1 and sat with it for a heating cycle. The noise didn't start until my pressure started to rise above 2.4 oz (its standard pressure until all the rads close up)... so I tweaked the Vent to eliminate the noise, and also set my VaporStat to 3oz cutoff with a 2oz differential. After about 30 minutes of running Any time the pressure rose above 2.4 oz it was on a fast track to 8oz+ and Vaporstat shut down anyway. So, with all that, I have finally ended up with a nice quiet system that heats all rooms evenly, within 1 degree of one another. It took a while, but I got there! Congratulations! Quiet, radiant, even, efficient steam heat! You can't beat it.